Despite the inclement weather yesterday morning, the highly anticipated launch of the now annual Prime Minister’s T20 Softball Cup went ahead as planned at the Everest Cricket Club ground. The event marks the first step towards the three-day tournament which is set to bring together top softball teams from Guyana and North America battling for cash and other incentives. 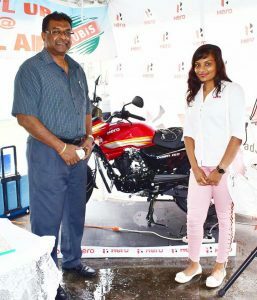 Minister Ramjattan and Sarah Persaud posing with the Hero Motor Bike that is up for grabs in the All-Star category. Speaking at the ceremony, Minister of Public Security Khemraj Ramjattan, who represented Prime Minister Moses Nagamootoo, said sport in any form may be used as a public security tool. “Sport helps people to understand the need for open spaces, the need to get fit which means no smoking, no drinking which is healthy,” Ramjattan said. In 2017, Prime Minister Nagamootoo made a sponsorship pledge of G$300,000 which was once again done this time by Minister Ramjattan who also spoke of the tourism benefits the country may generate from such a tournament. Added to that, there is an increase in the winning purse in both categories with the All Stars set to pocket $700,000, while the winning Masters team will win $600,000. Like last year, the Most Valuable Player (MVP) in the Open Category will ride away with a Hero Motor Cycle, compliments of Rose Ramdehol Auto Sales. In the Masters Category, the MVP will once again win a 55-inch television set compliments of Regal Stationery and Computer Centre who like Rose Ramdehol are repeat sponsors. Also present at the launch were Sarah Persaud of Hero Motor Cycles and Rawl Nedd of Banks DIH Limited who both spoke of their companies’ deep commitment to the success of the tournament. There were 20 teams in 2017 with Regal Masters rising above the 11 other masters teams and Speed Boat powering away from the other seven teams to the titles and G$500,000 and G$600,000 respectively. and sponsors at the launch of Prime Minister Softball Cup 2 yesterday at Everest Cricket Club. So far, the GSCL have confirmed that there are 24 teams that will suit up in the two categories from October 19 to 21. In the Open Category; Regal All Stars, Farm XI, Success XI, Boots All Stars, Corriverton Spartans, Die Hard All Stars, Bartica Rangers, Ontario Softball Cricket Association and defending champions Speed Boat will battle for G$700,000. In the Masters Over-45 category, the winning purse is G$600,000 where defending champions Regal Masters, Wellman Masters, HS Masters, R.R Masters, Fishermen Masters, Parika Masters, Success Masters, Tropical Spring Masters, Albion Masters, Florida/Guyana Hope, Impact Masters (Canada), NYSCL Masters (New York), Rebel Masters (New York), New York Hustlers (New York) and Better Hope Masters (New York) are set to lock horns. Another feature of the Prime Minister’s Softball Cup is that Florida Guyana Hope, a charitable organization out of the USA will be distributing various supplies to the value of US$20,000 to various individuals and organizations over the 3-day period.